Your dad deserves nothing less than the best. Seriously delicious cupcakes in time for Father’s Day. Vanilla based cupcakes topped with a vanilla frosting and a decorative Stripey Tie. Gooey chocolate based cupcakes topped with a smooth chocolate frosting and a decorative gold topper. 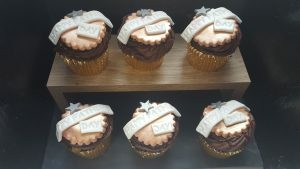 The yummy deliciousness of a cupcake for a ‘Top’ Dad is available from 29th May until the 18th June. Call our telesales team now on 01792 579908 to order in time for fathers day on Sunday 18th June or call us to pick up direct from the Bakery.